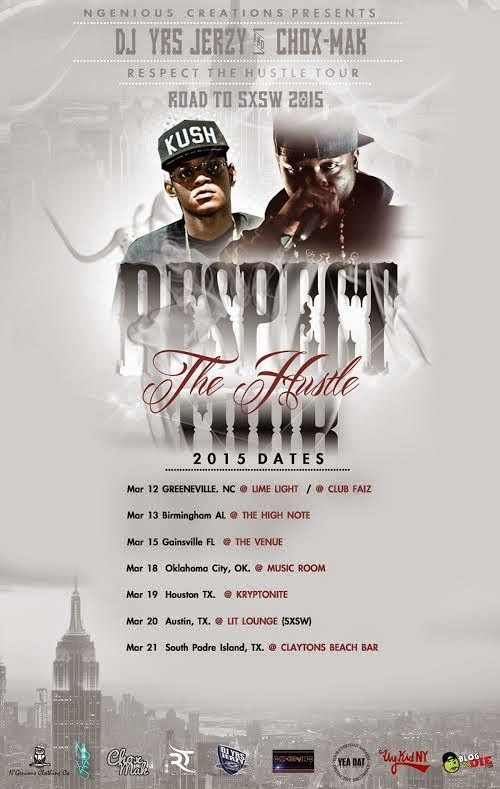 DJ YRS Jerzy & Chox-Mak's "Respect The Hustle Tour" Starts March 12th! DJ YRS Jerzy & Chox-Mak have been continuing to make moves all across the internet and streets for sometime now. Now that the fan base and demand for them is rising the show bookings of coarse come with that demand. Their "Respect The Hustle Tour (Road To SXSW 2015)" is going to be one for the record books. They are hitting major cities in each state they go to. There is alot to be done and they are willing to get anywhere to get the word out. SXSW is just one of the major shows they will be attending they have shows with Smoke DZA, Da Madia 6ix and more. They are also headlining one of the biggest spring break shows in the country in South Padre Texas March 21st. There is alot that will go on during this time period of them touring. Stay Tuned with what they have going on and use the hashtag #RespectTheHustleTOUR to follow up with the action.